I hope you were out & about for the Lunar eclipse today (3:30AM-this morning). The number of people near the Wharf, like me were in the wrong place. But did you see the strangest orange (Texas-Orange) colored moon ? Well, if you were in the right place at the right time this past weekend, you would have been at Beth Israel's Food Fest. Little did I know why I enjoyed the sound of Klezmer music from Eastern Europe so much. Was it Benny Goodman ? America's foremost jazz musician, who made the clainet one of the most popular horned instrument in the late 1940-50s ? The Jewish weddings? A combination of influences, I'm sure. 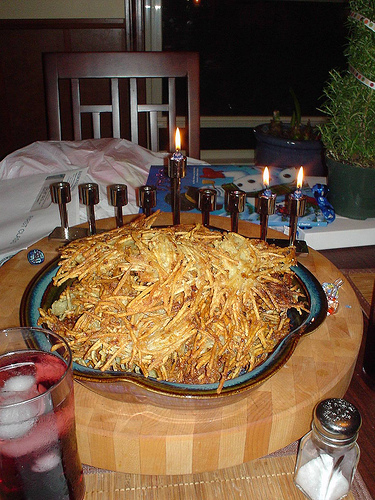 deep-fried & golden-brown shredded potato know as latke. 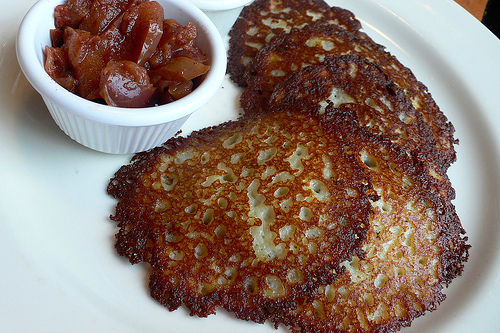 A Texas boy, Southern raised, the Jewish pancake, known as latkes is irrestible. I also ate them with maple syrup & grits. There are many ways to enjoy. The 20th Jewish Food Festival was not for the calorie conscious. With rugelach & latkes and the dynamic sound of the Klezmer clarinet in the background. High Holy Days of Rosh Hashanah (Sept. 13-14) & Yom Kippur ( Sept. 22). And my addiction to blintse ( בלינצע )or blintzes. Um-m-mh! Lending support to Beth Israel's Food Fest was San Francisco artist, Will Bullas. Mr. Bullas donated & autographed his vivid water-color like posters from the event for the synagogue's scholarship educational programs. Remember Godfather II, a toast was made to mob boss, Hyman Roth? Artist Will Bulas poster is aptly titled: Le'Chaim, "to life".